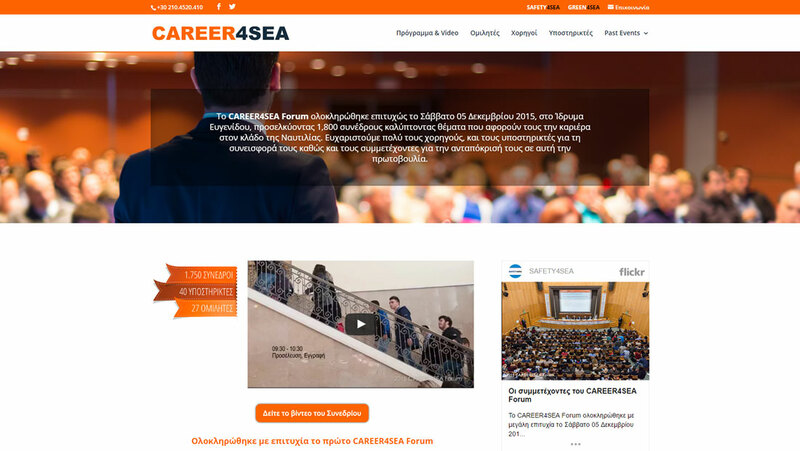 CAREER4SEA Forum (career4sea.com) concluded succesfully on Saturday 05 December at Evgenides Foundation attracting 1800 delegates and covering issues regarding careers in shipping. The conference was organized by SAFETY4SEA (safety4sea.com) including issues that interest young adults who wish to have a career in shipping and analyzing the present and future of the most vigorous and extrovert industry of Greece. Through the website of carreer4sea.com conference, the online registration of the delegates was actuallized as well as its transmission during its conduct (Live Blogging). Online registration form, Live Blogging and Responsive Design for the automatic adjustment of the conference web-page according to the dimensions of the user’s device screen! Utilizing the capabilities of WordPress and in conjunction with the analysis, design and programming services offered by iBS, we achieved in short time the development of career4sea.com. There was excellent performance yield of the available budget including the implementation of all new characteristics that were requested by the customer.